Prof. Dr. Umbreen Javaid is Chairperson, Department of Political Science and she is also Director, Centre for South Asian Studies, University of the Punjab, Lahore.She studied different courses for one year at Harvard University, USA.Her Research areas include extremism, militancy and terrorism; she also specializes in South Asia, Pakistan politics, regional studies, security studies, and peace and conflict studies.She is Editor of Journal of Political Studies, (HEC Category “X”) and she is also editor of Journal of South Asian Studies (HEC Category “X”).As, Head of the department, she introduced new programmes i.e., BS (Hons.) in Political Science, M.A. (International Relations), M.Phil. (International Relations) and regular Ph.D. (Political Science), University of the Punjab, Lahore.She has organized and conducted 11 national conferences and has also organized 173 seminars, workshops and lectures.She has attended and presented papers in a number of international and national conferences.She has twice received Best Teacher Award (2011) by University of the Punjab, Lahore.She has published 06 research articles in international and 81 research papers in national reputed journals.She delivered lectures at Columbia University, USA, Berkley University, USA and SOAS UK.She is also HEC approved Ph.D supervisor. She has supervised 21 Ph.D, 62 M.Phil and 36 M.A. theses. 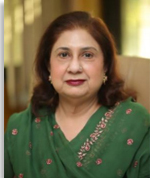 She is author of 12 books, one of her books received Best Book Award by Government of the Punjab.She has also been funded by HEC and University of the Punjab for various research projects.She has also received research projects by International Organizations.She is member of number of international and national societies, bodies and organizations. She teaches various courses of Ph.D, M.Phil and M.A. (Political Science, International Relations, Strategic Studies and South Asian Studies).